I have started to build a system/circuit to capture old cine 8/super 8 using the Cinecap programme. I am having trouble to get the IR receiver being triggered when a white blade moves passed the IR receiver. A cine projector that can run as slow as 3 frames per second (Eumig 610D). 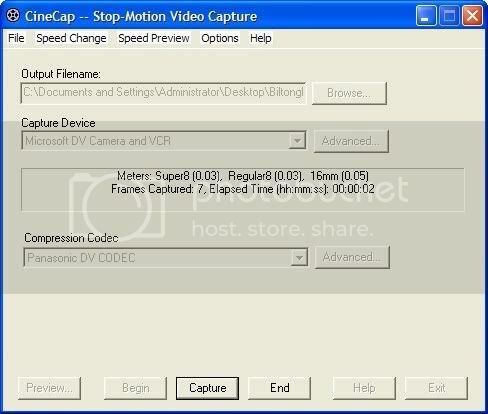 The moment that the frame "stops" for a split second, you need your camcorder to record the image and these frames are put together by the Cinecap into an AVI file. So when the frame stops, a trigger needs to be activated. In this case an IR receiver is the trigger. The IR receiver and all my connections (converted mouse; circuit board) are working well. My finger, or any white paper triggers a signal which captures a frame via my camcorder on Cinecap, BUT, the paper, my finger, etc need to be very close to the surface of the IR receiver to trigger the signal. It only works when I bring the IR receiver very close to the stationary blade. If the blade rotates at 3fps, it does not trigger a signal, although I bring the receiver quite close. 2. Or get a stronger?? 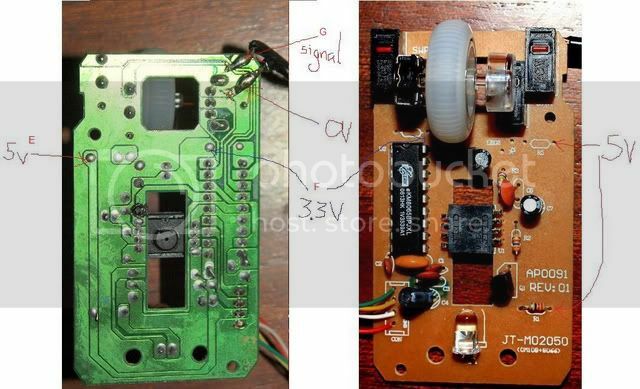 IR receiver. I feel that there must be a way to produce a strong input by means of some material to create the trigger. I used PVA paint. Any advice will be helpful. Will try it out in the next week or two. I need to acknowledge the help I got from James Rueben in this regard- he initiated the project, with the initial input fro Ronypony. 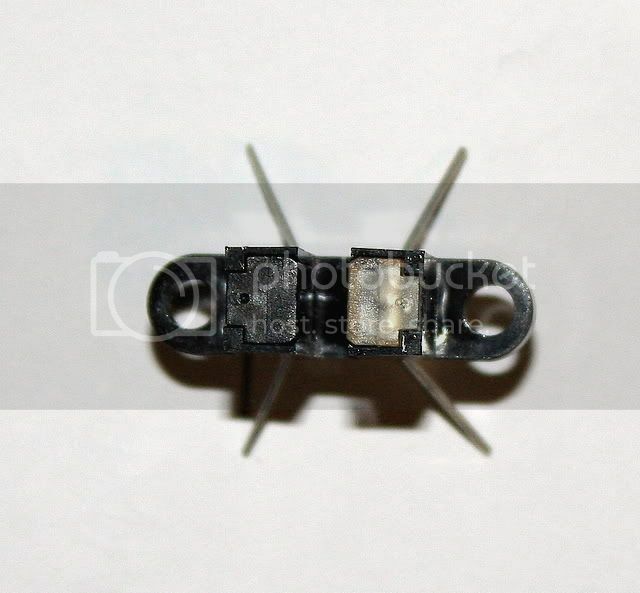 The distance is very close � 1-2mm, before the switch is triggered. So if I wave a white piece of paper 1cm in front of the detector, it does not trigger it. Projector projects to a lens (the Eumig allows for speed to go down with a gear system to 3 fps), produce an ariel image which is captured at 3fps. 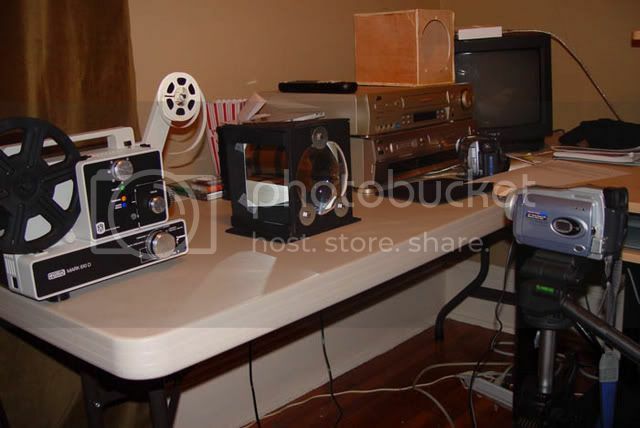 This is not my set up. 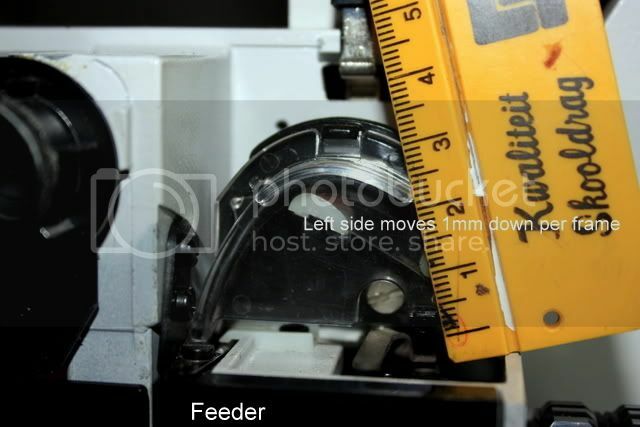 The photo that I have posted of the IR receiver next to the blade, is not mine. I havent fixed mine, but this is how I painted a blade. Someone advises that in stead of paint, I use a thin mirror or foil on the blade. Any comments on that? Sorry for the delay in response. I was a quite busy and am just having a bit of time to look through the data sheet you provided. That sensor needs to be very close to what it is reading. 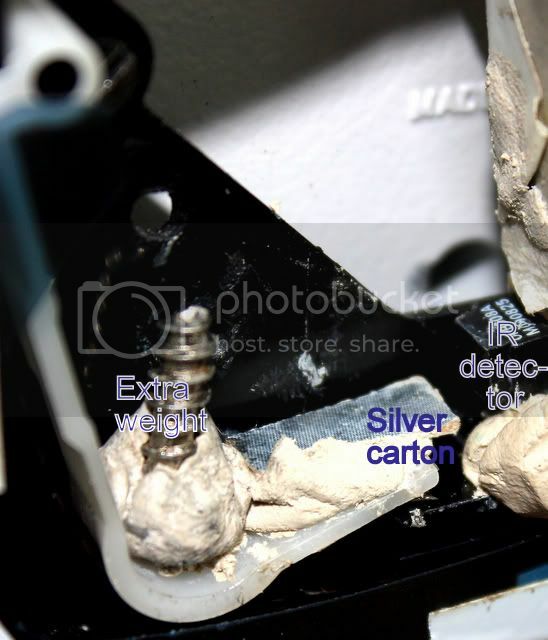 The diagram in the data sheet shows the measured item .11 inches away from the internal sensor. 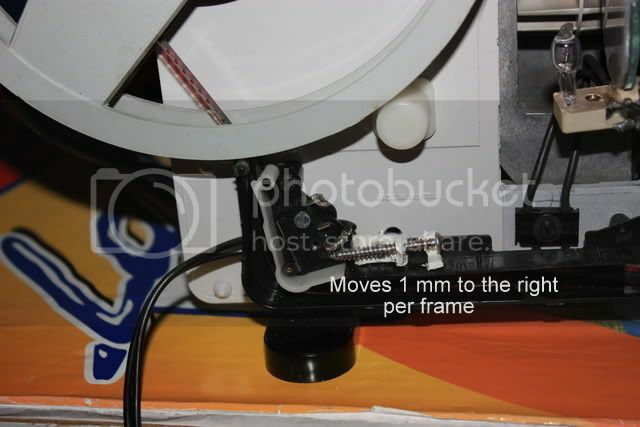 There is also .05 inches of material between the internal sensor and the outside of the case so that means that the measured item needs to be .05 inches from the front of the sensor housing (1.27mm). So it sounds like your experimental results are correct. Based on the 1.7 volt forward voltage on the LED you are driving it at around 18.3mA which is close to the 20mA that the data sheet tests were performed at but you may get a bit better results if you increase the current a bit, there is a 50mA max so there is lots of room to play. If you want I would aim for around 30mA. 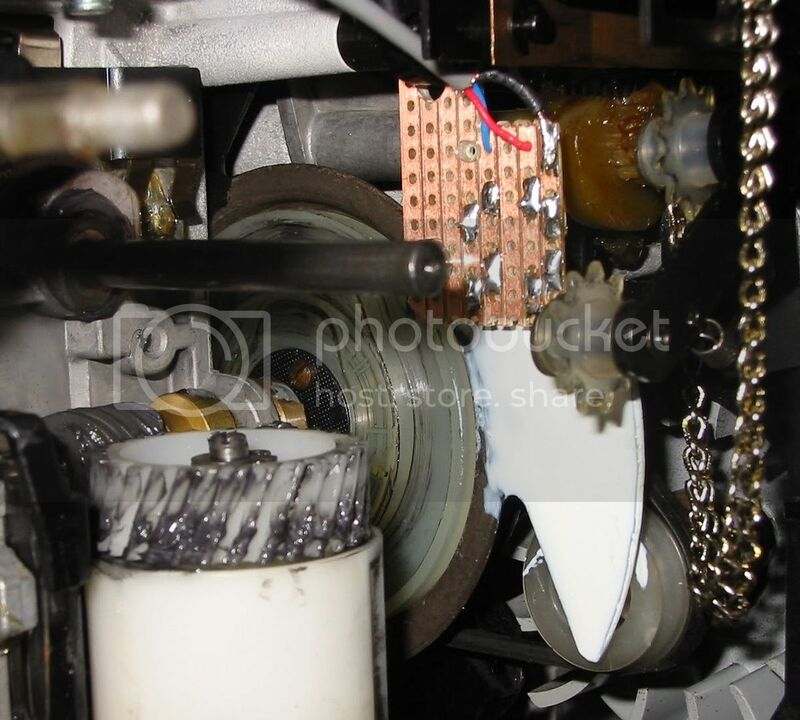 I have always been a fan of the sensors that have a tab that goes into them and breaks a beam. The concept is the same as your sensor but instead of looking for reflected light it looks for the beam being broken by something opaque. This may make it a bit more reliable but I am not familiar with the setup so there may be something that prevents this from being used. Thanks for the reply. I have had some other responses from other websites, so you might want to comment. -Either paint the blade aluminum, or use a thin mirror on the blade. Some felt I should change the R2 value to much higher e.g. 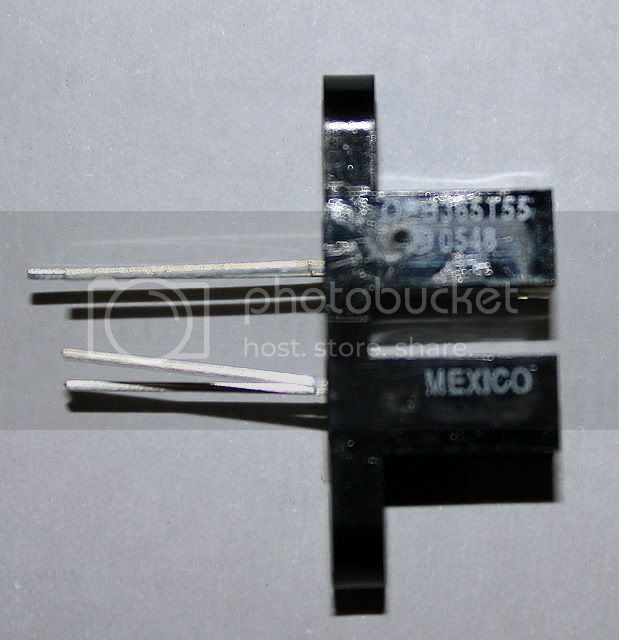 100k resistor and reduce R1 to 68 to 72 ohm. 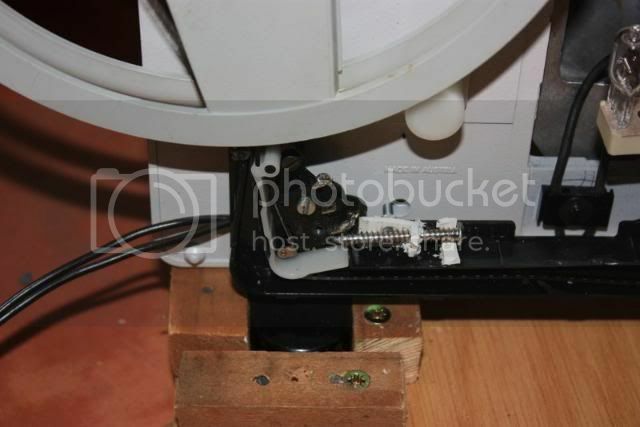 Since you already have it designed and built I would first try mounting the sensor about 1mm away from the area to be detected and see if it works. That is the distance it was designed for. 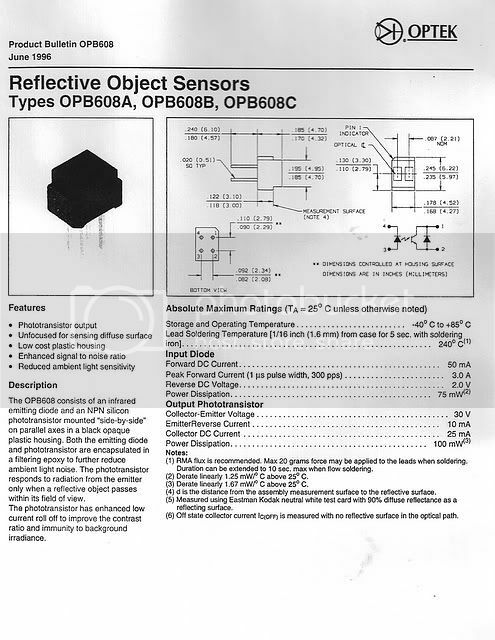 I am thinking that the LED and transistor optics are probably angled so that it will reflect best against a surface that is at the specified distance so with this device I don't think you will ever get good range. Changing those values may help but I think it should work fine as is. Projector off, blades stationary and white painted blade in front of the IR receiver: measure the 5 V (point E), 3.3 V (point F) and signal (point G). As a final check on the cables, measure between the zero volt point on the detector circuit and the zero volt point on the mouse. The projector state doesn't matter for this one. This should of course be zero or very close to it. 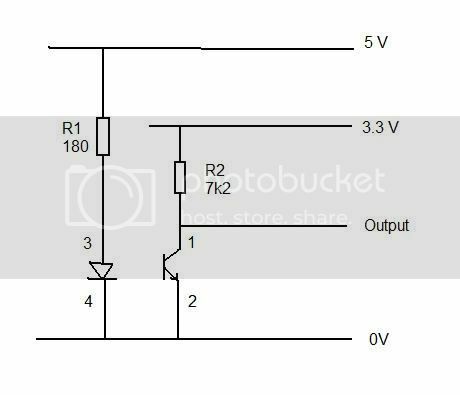 So it looks as my point E just produces 4.25V. So, I am not sure what I am doing wrong. 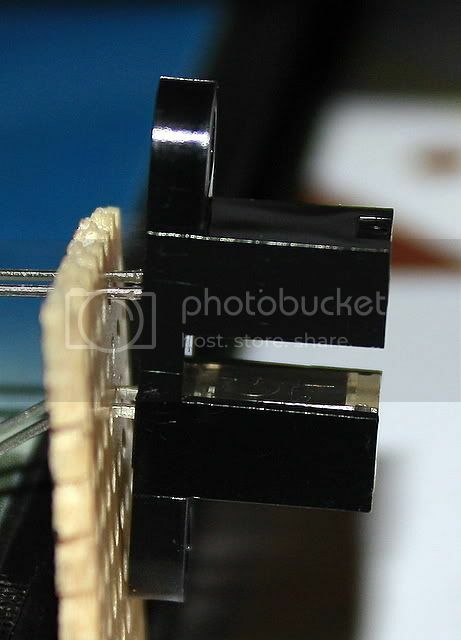 Does the beam need to be broken in that first 1mm transparent part, or does the object need to go deeper in the slit? These two possible trigger points are very consistent. 1. How deep should the object need to go in the slit (because if it needs to go deeper, it might be difficult)II thought of attaching a rigid plastic to the "moving" side of one ot the trigger points. 3. Do I need resistors? I have used my IR detector and mounted it to the rear trigger. I would say if it works stick with it. Congrats on figuring it out. 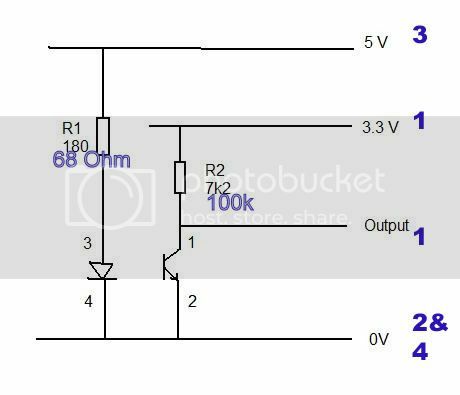 Use the same circuit as you've used for the OBP608, but alter the pinout as below.